Chicago’s Goose Island Beer Company has been brewing Bourbon County Stout since 1995, and I’ve been drinking it since about 2010. Released each year on Black Friday, it’s a cult-status bourbon barrel-aged imperial stout whose nuanced flavors change from year to year. Beer dorks love to debate which vintages are the finest, and some also love to knock this beer as a sell-out (Goose Island sold to Anheuser-Busch in 2011). What I’ve noticed from drinking this beer through the years is that often, the beer gets better with age. It can taste a bit “hot” when it’s fresh, meaning the alcohol in this brawny 14.7-percent ABV beer is just a little too distracting, a little too in-your-face. With time, that alcohol mellows out, flavors oxidize slightly, and the stout becomes more cohesive and enjoyable. Earlier this week, I cracked open bottles from 2012, 2013, and 2014 that I’d been holding on to in my cellar. None was past its prime—in fact, the 2012’s flavors had melded beautifully without losing any of its luscious texture. Yes, I’d suggest people age Bourbon County like a fine wine. But not this year’s vintage. The overall flavors are slightly more subdued than in years past, though this is by no means a “quiet” beer. Bittersweet chocolate flavor forms the baseline of the sip, with the bourbon barrels contributing some earthy vanilla; notes of sweet grapes and bright blueberry and coffee riff over the top. Now, to nitpick. Bourbon County 2018 is a world-class beer, to be sure, but I can’t help but think there are some flavors missing from the “middle.” My friend Ryan, a fellow beer writer who tasted this beer with me, said he wishes there was more of the soft, Tootsie Roll-esque flavors that have characterized past versions. Again, this is total nitpicking. This beer is better than 90 percent of the bourbon barrel-aged stouts other breweries are putting out. The upshot of the slightly toned-down booze and caramel is that this stout tastes great right now—not in three years, not after it’s collected dust in your cellar, but right now, the day you buy it. So on Black Friday, when liquor stores from Dubuque, Iowa to Prescott, Arizona begin selling this beer, you can get your hands on an exemplary bourbon-barrel stout that you could enjoy that very same day. And that’s sure to help with all the extended family you’ll be seeing this week. 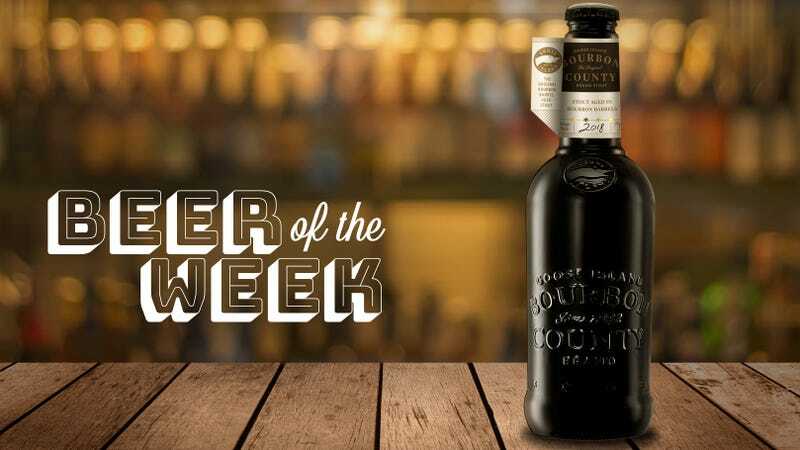 Bourbon County will be distribute to most of Goose Island’s national accounts, though in limited quantities.